Cottage Courts to Condos Privateer 6500 Estero Blvd. This is a "Then and Now" history with the population growth of Estero Island literally "Growing Up" from "Small to Tall". It begins as a tiny fishing village after the Caloosa Indians vacated this barrier island during the 1700's. In 1865 the census listing was one family, when the Ellis family built their home on the highest island mound. Later, the Koreshans built their two story house on the south point, and by 1906, the Case family built a Tudor style home where they, too, chose the high side of the bayside mound. 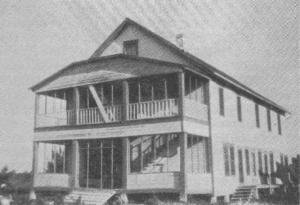 The population was listed as very few, when the three story Winkler Hotel was constructed on the beachfront as seen here in 1912. At this time the island was still only accessible by boat. When the first toll bridge was built in 1921, the population of this tiny fishing village grew to 62. 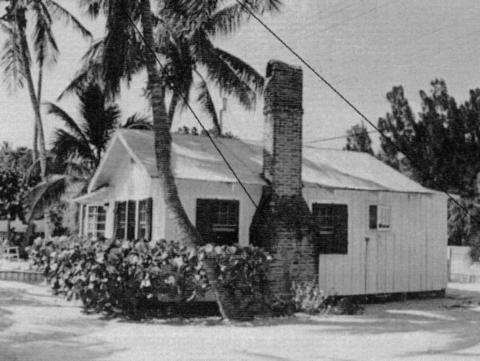 "Silver Sands" became the first cottage court offering four palm thatched cabins to overnight visitors, and soon beachside and bayside cottages began to emerge. 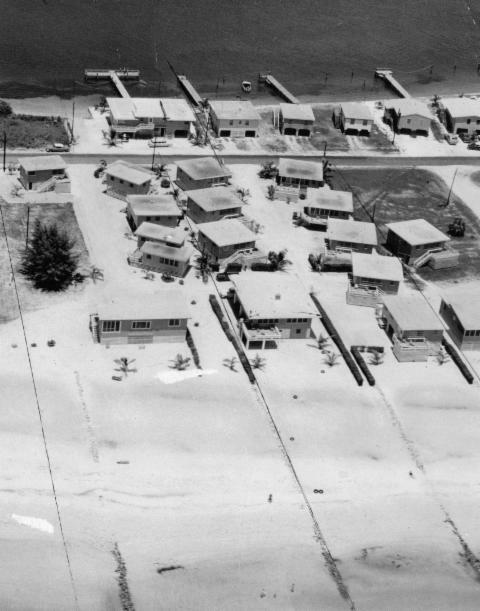 During the 30's and 40's the "Beachcomber" and "Side-o-Sea" were also popular cottage courts and the start of the beachfront motels, as seen above, when the "Skyline" and "Rancho del Mar" opened by 1949 with four hotels already in place to a population of 473. By 1950 the population totaled 711. With the sale of government property to the north, and Koreshan property to the south, the entire length of Estero Blvd. was finally paved. 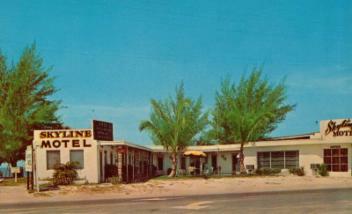 The popular "Island Shores"," Seascape" and "Pink Shell" cottages, seen above, opened and later more cottage court colonies and motels appeared; so, too, did more businesses and homes with the new type of CBS construction. Cinder block structures were built directly on the ground level as many subdivisions and canals were dredged for higher ground. 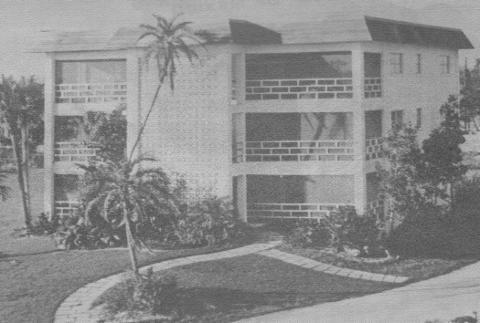 In 1959 the "Privateer", seen below, opened as the first three story high rise co-op apartment building, which later changed to interval ownership as did the "Sandpiper" and "Neptune Inn" motels of that era. By 1960, the population had soared to 2,464 with the growth of more restaurants and shopping centers. The south bridge opened in 1965, bringing more traffic with concerns for bike paths and pedestrian safety. In 1970, the population was 4,305 when "Leonardo Arms", above, opened as the first condominium at the south end of the island, followed by "Island Towers" in 1971 at the north. The new Skybridge was completed by 1979 overlooking the little barrier island that had "Grown Up" to a population of 6,400 by 1980. Fifteen condos now share the beach shoreline with 5,000 units by 1986, with more to follow on the bayside. Residents' concerns for the environment and habitat grew as land was gobbled up when the population had more than doubled to 6,818 by 1990. The town incorporated in 1995 as cottages and small businesses began to disappear for more high rise density. The pleas for preservation of land and natural resources were heard when Little Estero Island formed and was quickly designated as a Critical Wildlife Area at the south end of the island's fragile shoreline, as seen below. By the turn of the 21st century the population had reached 6,844, of which 5,614 were condo units by 2013. It is encouraging to know this still leaves small pockets of cottages, homes and favorite small businesses which are the small town flavor of Ft. Myers Beach. As new, larger, Mediterranean style homes are now required to build higher with FEMA and code restrictions. This is perhaps a window of opportunity to restore and refurbish the small, old Florida style cottage charm of Estero Island. This is our heritage, and Fort Myers Beach today is one of the last Florida beaches that has a healthy flavor of the "Then and Now". Let's preserve it for all generations.